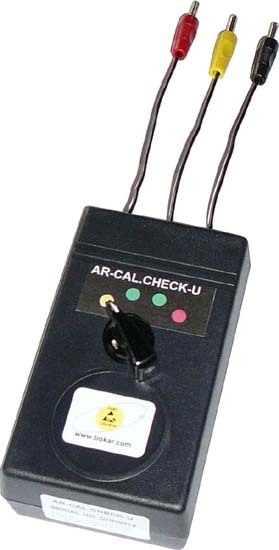 AR-CAL.CHECK is a New Addition to our microprocessor controlled line of Wrist Strap and Footwear Testers. 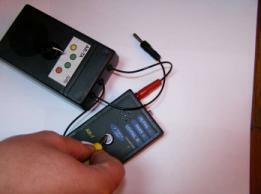 It provides the user of AR-7 or AR-8 Testers with a vehicle to test at his own facility the accuracy of calibration without the need of sending them to a manufacturer or a Distributor for periodic check. Please see Operating Instruction (Manual) to find out how easy it is to verify if your Wrist Strap/Footwear testers are properly calibrated. Note: Please make sure that you have correct model of the AR-CAL.CHECK-X, appropriate for your location. Model AR-CAL.CHECK-U is for North America and model AR-CAL.CHECK-E is for Europe. Do not touch metal elements during entire testing procedure. Plug red banana plug of the AR-CAL.CHECK Calibration Checker into left, red socket of the AR-7 tester. Plug red banana plug of the AR-CAL.CHECK Calibration Checker into left, red socket of the AR-8 tester. Plug black banana plug of the Calibration Checker into right, black socket of the AR-8 tester. Set the rotary switch on the front panel of the checker to the first position (Yellow circle). Hold Yellow banana plug properly in such a way so that your finger does not touch banana plug metal section. 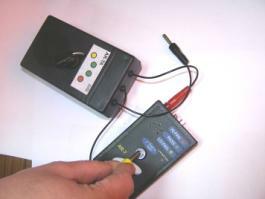 Press and hold metal pushbutton in the center of the tester with yellow banana plug. 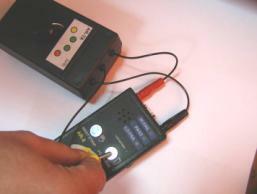 When the calibration is correct, AR-7 tester should indicate "LO-FAIL" (Yellow LED will illuminate). If yellow LED did not illuminate, the unit needs to be re-calibrated. Press and hold metal pushbutton on the left side of the tester (wrist strap button) with yellow banana plug. When the calibration is correct, AR-8 tester should indicate "LO-FAIL" (Yellow LED will illuminate). Press and hold metal pushbutton on the right of the tester (footwear button) with yellow banana plug. Press and hold metal pushbutton on the left of the tester (wrist strap button) by the yellow banana plug. When the calibration is correct, AR-8 tester should indicate "PASS" (Green LED will illuminate). Press and hold metal pushbutton on the right of the tester (footwear button) by the yellow banana plug. Press and hold metal pushbutton on the center of the tester by the yellow banana plug. When the calibration is correct, AR-7 tester should indicate "PASS" (Green LED will illuminate). When the calibration is correct, AR-7 tester should indicate "High Fail" (Red LED will illuminate). When the calibration is correct, AR-8 tester should indicate "High Fail" (Red LED will illuminate).